"Proclaiming, Worshiping and Witnessing Community of God"
The Catholic Church of Loikaw is a community that is one in spirit, nourished by the Word of God, proclaiming, witnessing, and working for evangelization and human development that is rooted on charity and peace so that all may have life in abundance. -Engage in dialogue with other religions by mutual understanding and cooperation Touch the hearts of the people, especially the poor through charitable assistance, socio-economic projects, educational understanding and the use of modern media communication. People in Loikaw live in peace and harmony with dignity, hope and spiritual motivation for service founded on the social teachings of the church for a deeper sense of responsibility to church, family and for one another in education, health and economic improvement. Our Framework for development is founded on the Catholic social teachings. Realizing the need for reconciliation and peace among tribes and people of different religions and serving everyone regardless of religious belief, peace shall be the end goal of our activities. The means to achieve this is relief and welfare for the displaced, catechetical formation, health services, basic education and poverty alleviation. Families, youth and children participating in the programs shall be given religious instruction and understanding of faiths for harmonious relationship with others. Loikaw Diocese located in Kayah State, is the smallest of all 14 States and Divisions in Myanmar. It covers an area of 4,500 square mile, mostly hills and mountains. It is bordered with Thailand in the East, Shan State in the North, and Karen State in the West and South. The population of Kayah State is about 301,187 resulting in an average population density of 17 persons per sq. km. 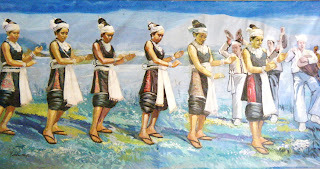 About three quarters of the population are ethnic minority groups; Kayan, Kayaw, Kayah, etc. while the remaining quarter are Burmese, Shan and Karen. Christianity and Buddhism are the two dominant religions in Kayah State. This place is regarded as the stronghold of Catholicism in Myanmar. Efforts have been made to reach out or have dialogue with people of other religions. In 1960, the diocese of Taunggyi inclusive of the whole Kayah State was established with territories taken from Taungngu Diocese. The tireless efforts of the first Bishop, Msgr. J.B. Gobatto, produced a great number of Catholics, priests and religious and it was felt that Kayah State with Loikaw as capital was ready to be a dio-cese on her own. The prophetic vision of Rev. Fr. Paolo Manna (a candidate to sainthood) in 1907 said that Loikaw should be established as a center from which to expand the evangelization works in the whole of Kayah State came true on Nov 14, 1988, when His Holiness John Paul II erected the diocese of Loikaw and created its first Bishop Msgr. Sotero Phamo from Kayah soil. Loikaw Diocese was officially established on April 22, 1989 with territory taken from the Archdiocese of Taunggyi, consisting of 7 Townships, within the Kayah State, Eastern Part of Myanmar. Soon after its erection as the new diocese in 1989, Loikaw Diocese continued with the little Evangelizers program which was instiuted a year before in 1988. After four years of evangelization activities in Shadaw area, there was a conversion of about 3500 people. Since then (850) young people joined Zetamans and com-mitted at least 3 years services happily. Their zeal and dedication proved that lay people can contribute immensely in the missionary work. Even five of them lost their lives while working in the field of evangelization. The institution of the Diocesan Pastoral Council on February 5, 1993 has been a big step in the building up and growth of the diocese. Every parish formed its own Pastoral Council to coordinate the apostolate activities of every pious association in the diocese such as Catholic Action, St. Anne’s Associations, Legion of Mary, Youth, Daughters of Mary, Catechists, Zetaman, Kyaungdagas, Religious and Priests. The evangelization work of the Church is not limited only to the spiritual aspects but it covers the integral human being based on the teaching of the Church. To promote human and social devel-opment in the diocese, Loikaw Karuna was founded on August 23, 1993 and it began the works for all in basic health, education, rural water supply, agriculture and community development animation courses. The Diocesan Pastoral Centre constructed in 1990 for clergy and administration office was completed and blessed in 1995. The first Diocesan Pastoral Congress was held on April 17-18, 1996 participated by the then 24 parishes. After presenta-tions and proposals were made by parishes, institutes and other associations, decisions and plans were laid down for future pasto-ral activities for the diocese. The diocese celebrated its Tenth Year Anniversary on April 22, 1999. The anniversary celebration was marked by the second Diocesan Pastoral Congress held on April 17-21, 1999. The primary objective of the Congress for the diocese was to become a self-supporting and self-evangelizing Church. On the occasion of the Millennium Jubilee celebrated on November 25, 2000, the new Christ the King’s Cathedral was con-secrated. The occasion was solemnized with the ordination of 7 new priests attended by over 30,000 faithful ,4 Bishops, 200 priests and 300 religious. The diocese had its third Diocesan Pastoral Congress on May 21-23, 2003. With its aim towards a participatory Church, the congress urged every faithful to actively get involved in all the liturgi-cal leading roles of the Church and to begin the self supporting projects by Sunday donation, regular contribution of tithe and giving Mass offering by every family. Loikaw Karuna celebrated its Tenth Anniversary on December 10-12, 2003 reevaluating the role it has played in sectors of Loikaw Karuna to become witness of God’s love and for the evangelization work of the local Church. In communion with the Universal Church, the diocese celebrated the Eucharistic Year from October 2004 to October 2005 at diocesan level. Diocesan Eucharistic Day was celebrated on November 21, 2004 with ordination of 5 new priests attended by over 10,000 faithful. The program also consisted of the Holy Eucharist adoration by groups and concluded with the Eucharistic procession in the evening. The fourth Diocesan Pastoral Congress was held on November 22-25, 2006. The congress reviewed the past achievements of the third congress and laid down further plans to carry on with the decisions of the third congress for making the diocese a fully participatory Church. It also stressed on the participation of lay people in the activities of the Church in the diocese and supporting the local Church as well through donations which are to be collected in a more organized way by the persons concerned. The congress was followed by the ordination of three new priests on November 26, 2006. Invited by Bishop Sotero Phamo of Loikaw Diocese, the apostolic delegate to Myanmar, Archbishop Salvatore Pennacchio, visited Loikaw Diocese on November 22-25, 2007. As Bishop Sotero Phamo was stricken by stroke and being unable to speak and move well, the apostolic delegate ordained eight new priests for the diocese on November 25, 2007. As the number of priests has increased and demanded by the need of people, three more parishes were erected in the early year 2008 making a total of 34 parishes in the diocese. Considering the increase in the number of priests and need of various charisms as well, the bishop of the diocese has opened to his diocesan seminarians for the option of other religious congregations such as Order of Dominicans and Missionaries of Faith. The bishop also introduced young girls to new religious congregations such as Blessed Sacrament, Daughters of Charity and Dominican Sisters. The fifth Diocesan Pastoral Congress was held on Sept 25-26, 2009 discussing the new ways of evangelizing activities and revising the realized and unrealized decisions made in the previous congress with the vision that people may have life and have it abundantly (cf.Jn 10:10). 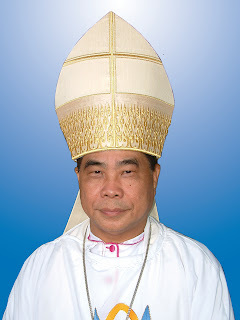 Due to his deteriorating health and premature age, Bishop Sotero Phamo asked for an auxiliary bishop and Rev.Fr.Stephen Tjephe was nominated as auxiliary bishop of Loikaw on June 19, 2009. Despite his failing health, Bishop Sotero phamo worked for months on extending the diocesan center composed of a meeting hall, refectory, chapel and compartments for a new bishop. The newly nominated auxiliary bishop was then ordained on November 21, 2009 by Archbishop Salvatore Pennacchio, the Apostolic Delegate to Myanmar at his second visit to the diocese. On the following day, two young priests for the diocese were ordained. In brief, as far in 21 years, the following is the data of the present 2011 Church of Loikaw Diocese.